Have you thought about how you are going to celebrate Canada’s 150th birthday? 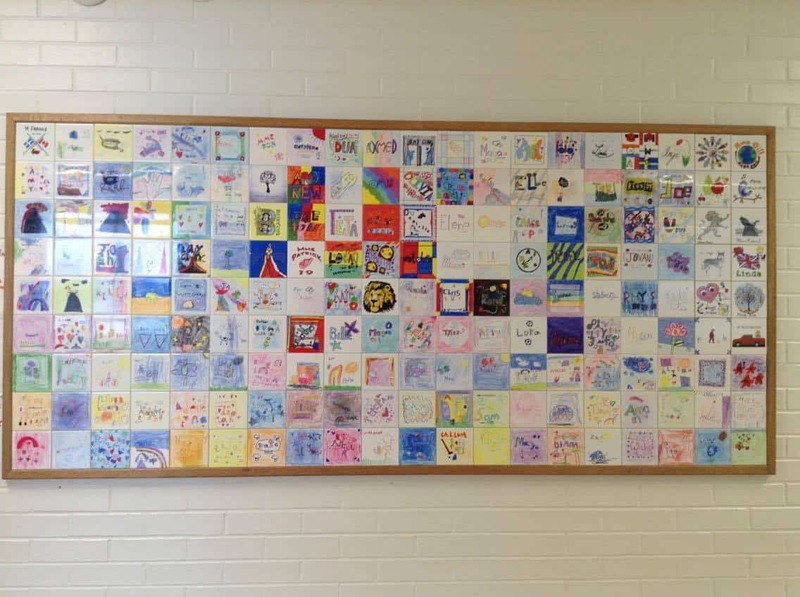 Why not consider building a Commemoration Tile Wall to mark the year. With the help of Budding Artists you can make the celebration an easy one whose memory will live on long after 2017. Include everyone at your school or limit it to a single classroom or social group. The choice is yours, but the process is easy however you choose to run it. You have a few choices on tiles. Ceramic and Hardboard Tiles (4.25 x 4.25) cost $5, including shipping and handling. Smaller hardboard tiles (2 x 2) cost $3. Decide whether you want your Tile Wall to be part of a fundraising initiative or the focus of a community event. There are different ways to proceed with the building of your Tile Wall, depending upon your needs. Fundraiser – Charge more for the tiles ($7-$10). Everything over and above the $5 cost is your profit. If you have parents unable or unwilling to pay for the cost of the tile, but you want to include everyone in the process and final product, factor them in, but reduce your profits accordingly. 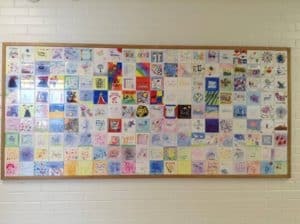 One way to raise money to pay for the Tile Wall is to run a Budding Artists Artrageous fundraiser. Everyone creates artwork, which is sent home with an order form. Parents purchase products made from their children’s artwork with a potential profit of 25%, depending upon the cost you set for products. Community Building – Include everyone in the process, regardless of whether they can afford to buy a tile or not. Charge everyone $5 to cover costs of the tiles or use money from your Parent Council or from other fundraising efforts to pay for the wall. You can ask for families to sponsor extra tiles. Decide on a theme for your tile wall. 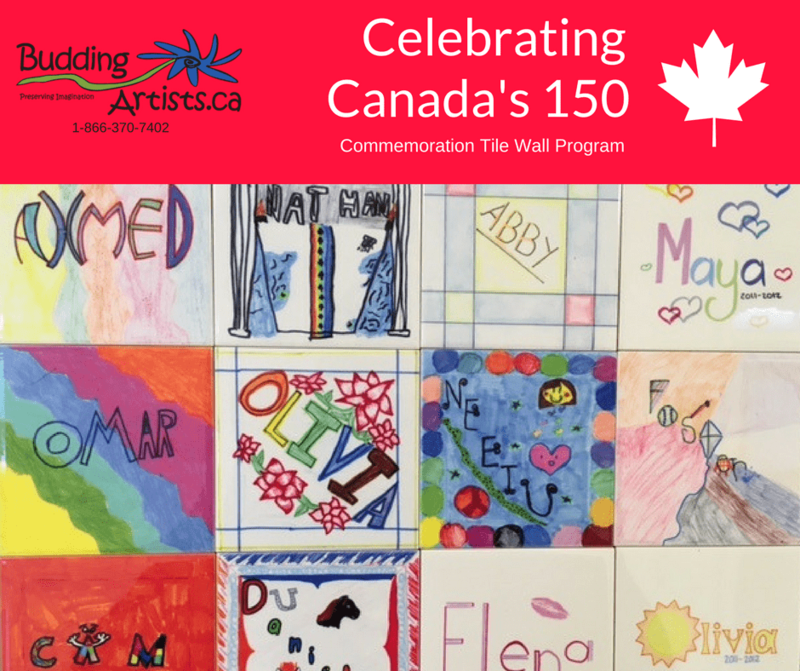 If it is for a Canada 150 celebration, ask everyone to design a tile with that in mind (what does Canada represent to you? what images come to mind when you think about Canada?). Another option is to choose specific colours to unify the look of your wall (perhaps your school colours?). 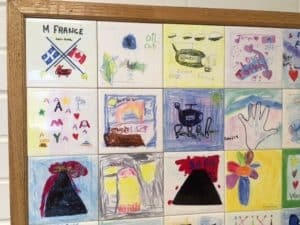 The choices are endless, but make sure to instruct the children on the theme of their tile before designing it. Who will facilitate the making of the art? Will you have children design their tiles at school or at home? If at school, who will be the one to oversee the process? Make sure instructions are clear to ensure your final product fits with your theme. How will you display the Tile Wall? Will it be permanently attached or will it have the ability to be moved? Tiles can be directly attached to a wall or placed on a board, making it movable. Make sure you get permission from the administration before installation if you choose to make the display permanent. Who will construct the wall once the tiles are completed? Where will it be located? Decide on a delivery date. Here is our calendar. No matter what you are celebrating this year, an anniversary or special historical event coming up at your school, Budding Artists is here to help.